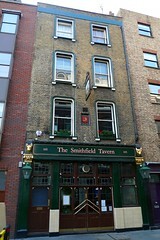 The Smithfield Tavern was a pub near Smithfield Market. It closed down by August 2015, and as of December 2018 the premises are occupied by a branch of Simmons bars. John and friends visited on a Saturday evening in March 2013, and it was very quiet. Aside from our group, there were fewer than 10 other customers between 5pm and 8pm. The chef didn't arrive until about 6pm, but food would normally be available earlier. They had Aspall cider on tap, and 4 other bottled ciders in the fridge. They also had some beer on tap, including a craft beer (Esse? Jeffe?) that only had half-pint glasses. They also had a range of white wine. The drinks were quite expensive: almost £4 for a pint of beer, and £16 for a bottle of Pinot Grigio wine. All the cooked food is vegetarian or vegan. They have a "pie of the day", but this turned out to be Faux Pie: the filling was served in a ceramic dish, with a piece of puff pastry on top. This is an abomination in the sight of the Pie Overlord! Also, John discovered that the filling was hot enough to burn his tongue. The people who ordered sausages said that they tasted very good, and the people who ordered onion rings were quite surprised at how huge the plates/portions were. According to the sign outside the pub they do Sunday roasts, presumably from a separate menu. The pub advertised bingo nights (with a tombola) on Monday evenings. Accessibility: There's a step up to enter the pub, and a small step down to enter the toilets. Last visited by John, March 2013. Last edited 2018-12-16 11:42:55 (version 9; diff). List all versions. Page last edited 2018-12-16 11:42:55 (version 9).